Tonight I attendedmy first concert by The Patti. 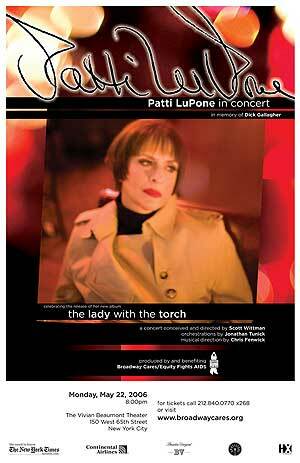 She called it Patti All Alone or "The Lady with the Torch". She definitely was on fire. She waxed poetic about what a torch song is - she surmised that perhaps its when you're carrying a torch for an unrequited love...or more likely when you just want to burn the creep's house down. She was in fine voice and had a nice big band backing her up, complete with a horn section and xylophone. She's right at home at the Vivien Beaumont at Lincoln Center - she got married on that stage for Christ's sake. She hammed it up but brought tears to my eyes too. She is a damn good entertainer. Our Row C seats turned out to be the first row. I had fun celebrity whoring as the audience was packed with them: Michael Cerveris, Diana Dimarzo, Benjamin Magnason and Manoel Felciano as well as John Doyle. I also spotted Joyce Randolph (from the original Honeymooners! ), Kristin Johnson, Annie Golden, Marc Shaiman, Jack O'Brian, Jonathan Tunick, Scott Whitman, Edward Hibbert, and Kurt Deutsch. (Patty - Bernadette's assistant - was also there, sans Bernadette). 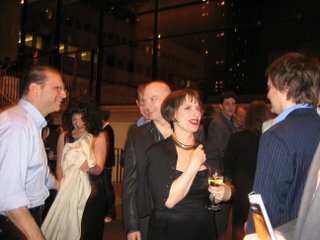 We went to the after-party and mingled with Michael Cerveris. I enjoyed patting him on the back and Kari enjoyed commenting on his stripes.